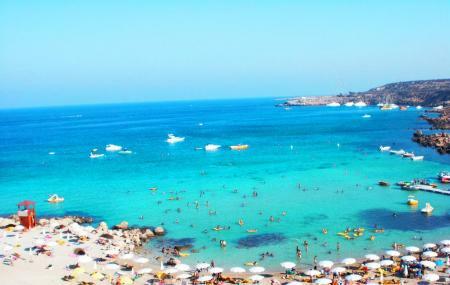 Konnos Bay is a clean sandy beach that lies to the Eastern edge of Ayia Napa where it joins with the Protaras regions. The beach gets busy on weekends and during peak season. Various water sports contribute to the entertainment on the beach. The opulent pine fringed hillsides that encompass the beach adds to the beauty of the landscape making it all the more attractive. Don’t miss the sunset at the beach. There is a lovely snack bar close to the beach. Train: Brunswick Rail (Cyprus) Limited. Bus: Nissi 2 Bus Stop. Love this? Explore the entire list of places to visit in Ayia Napa before you plan your trip. Fancy a good night's sleep after a tiring day? Check out where to stay in Ayia Napa and book an accommodation of your choice. How popular is Konnos Bay? People normally club together Ayia Napa Monastary and Ayia Napa Sculpture while planning their visit to Konnos Bay. People also prefer to end their day with Konnos Bay. A nice quiet bay unspoilt by mankind. Lots of free parking located at the top of the road and also lower down using the beach access road. Nice hotel I stayed alone and it was very nice Konnos Bay Hotel is 3 stars but I thought it is very nice!